Website visitor and ace modelmaker Jack Reynolds contributed these photos (courtesy of Forrest Bond from Racefax.com) of the rare and interesting H Modified sports/racer he once owned. From Jack Reynolds: "This Ferry 750 Sport was built in Paris in 1955. The car was raced in the Sport 750 class in Europe driven by Jacques Blanche and Louis Pons. 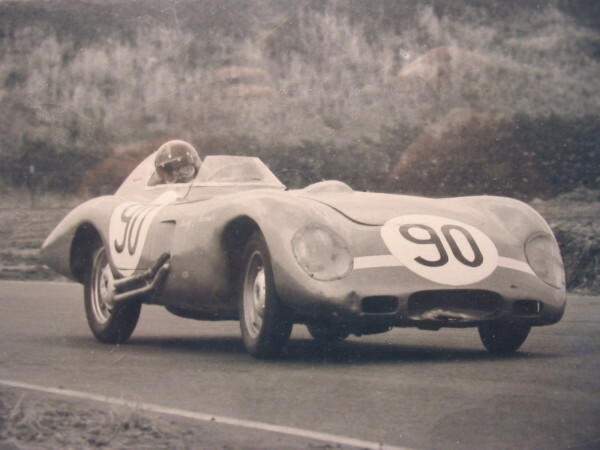 It was entered at LeMans in 1955 as a reserve. Other outings included endurance races at Rheims, Montlhery and the 1956 Mille Miglia resulting in a DNF due to an accident in the rain." This photo shows the car at Willow Springs. Another photo showing the car at Willow springs. 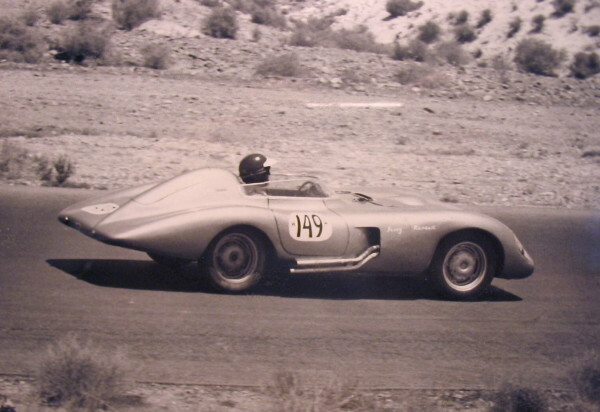 "Jim Parkinson brought the car to California enjoying success during 1957. The highlight of the car's history is probably the color centerfold in the April 1958 issue of 'Road & Track' Magazine. The low point is when I sold the car to an individual who cut up that beautiful aluminum skin in an ill fated attempt to build a dune buggy. The remains were scrapped." "Orange County Raceway "Sports Car Course" Drag strip and return road run backwards." "The engine is a 750cc Renault. I am driving in the photos which were taken during practice sesssions in 1967. The car was a one off built by Pierre Ferry. It had a tube frame, full envelope aluminum body including belly pan, 40 gallon fuel tank with filler under the headrest, a five speed "crash" box with selecter on the driver's left, extremely comfortable cushioned leather seats on aluminum frames, removable aluminum tonneau with Dzus fasteners, leather hood straps, rear panels to cover the wheels and a remarkably roomy cockpit. (I am 6'4" and drove the car comfortably without modifications) A roll bar was installed under the headrest. 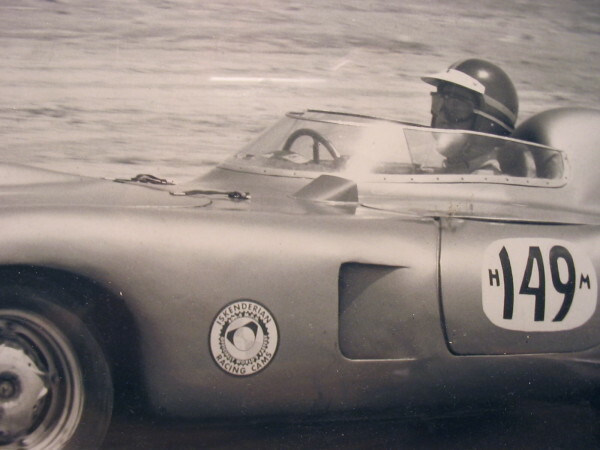 It's competition in Europe included OSCA, Stanguellini and Moretti." "Pierre Ferry built many special Renault Powered cars. a Ferry repared Dauphine won its class in the Mille. I think 1955? I want to tell a little about the Ferry Renault Jack Reynolds owned. It was never cut up into a dune buggy, the car is very much alive. It was found it in a junk yard about 6-7 years ago, in Riverside county. The car sitting on a pallet. It was also featured in a 1958 issue of Road & Track, next to a Ferrari. Last I heard the car is being restored somewhere in California. Car was so fast in its day, the SCCA officials demanded a engine teardown, when it was outrunning D-types and Ferrari's in the late 1950s. It won at Paramount Ranch, and its class at the "L.A. Times Grand Prix" at Riverside in 1959 (?)."